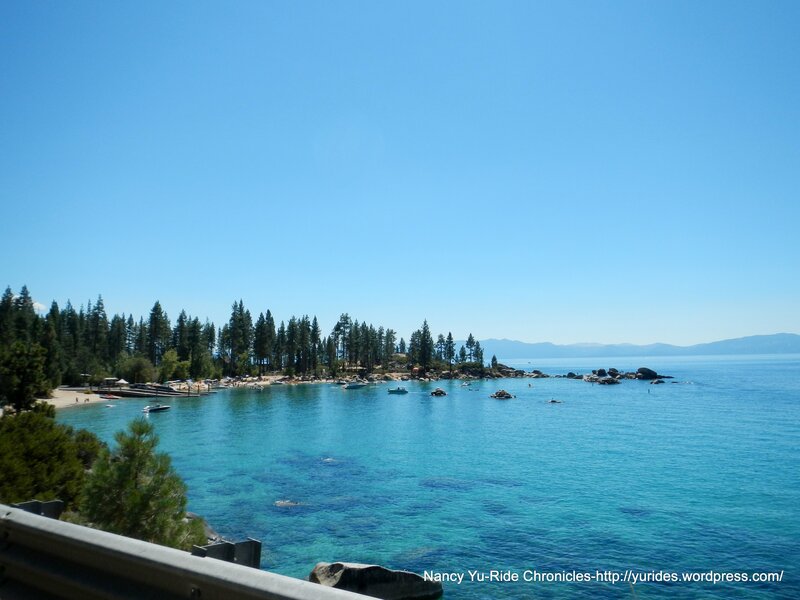 The ride around Lake Tahoe is considered one of the “must do’ rides in California. 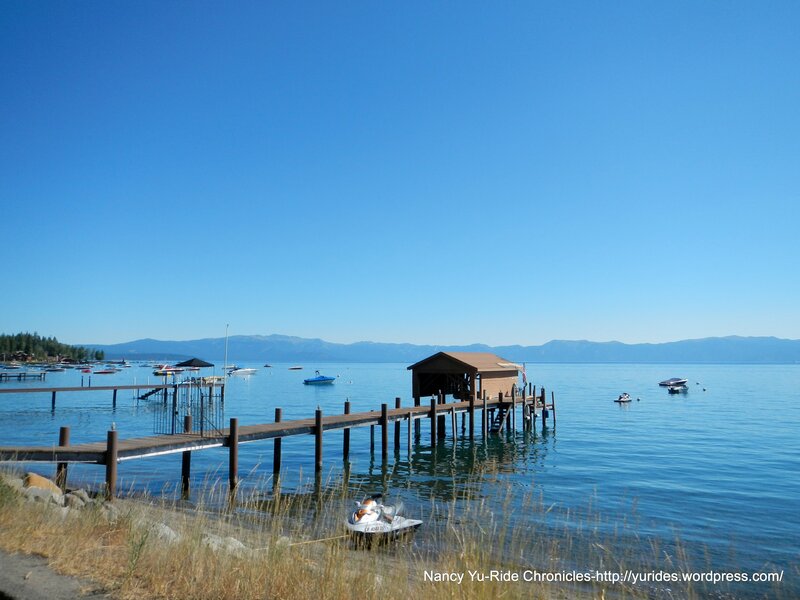 It’s best to do this 72 mile loop in a clockwise direction; you stay on the lake side of the road with gorgeous views of the lake and have opportunities to stop at the many Vista Points along the way. You really can’t get lost-just keep making right turns! Since this is a loop, you can practically start this ride anywhere along the route. 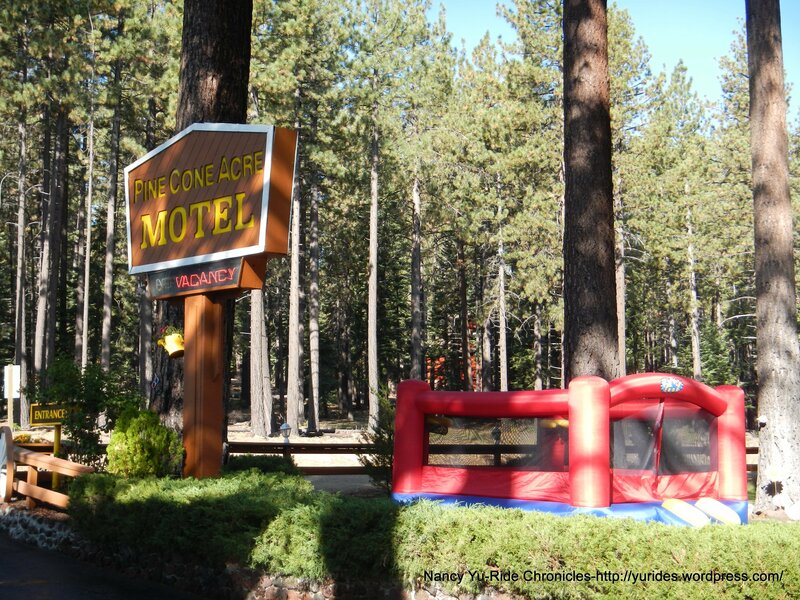 We’re staying at the Pine Cone Motel which is located right on Emerald Bay Rd/Hwy 89.The Pine Cone is a quaint little no-frills place to stay-it’s not high end but it’s clean. The folks that run the place are warm and friendly. It’s also dog and kid friendly with fun activities on site to keep the family happy. You can swim in the pool, play ping pong, tether ball, target practice, toss horseshoes and other stuff. 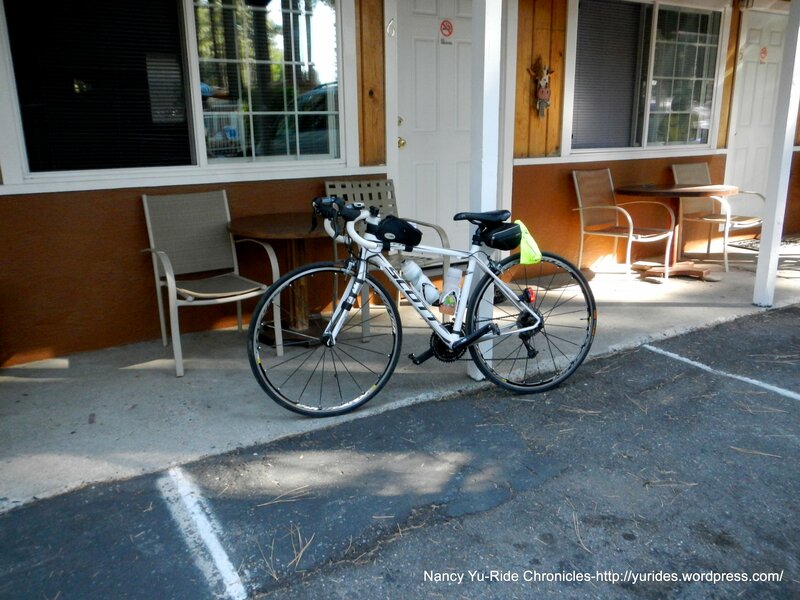 Consider booking a room with a kitchenette; it’s great to stay in and have breakfast before heading out for a ride. 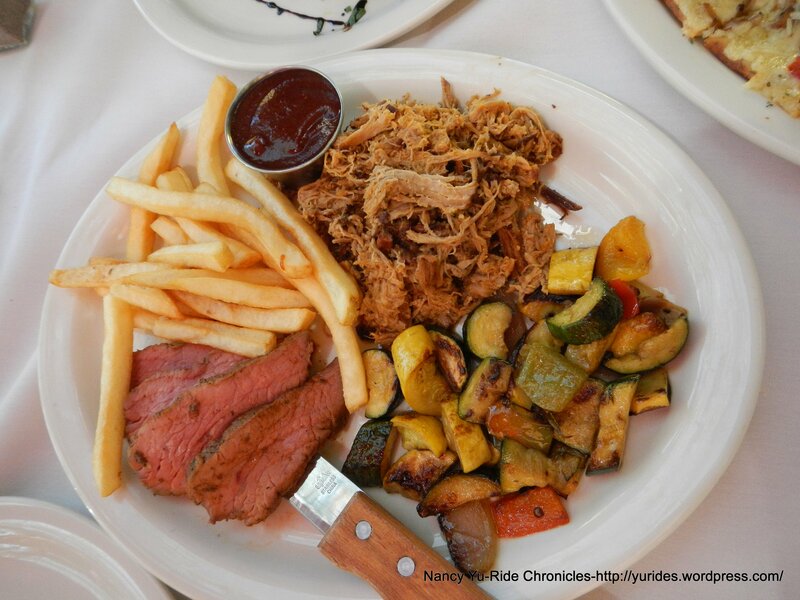 It’s a time saver and easy alternative to having to find a place to eat in the morning. 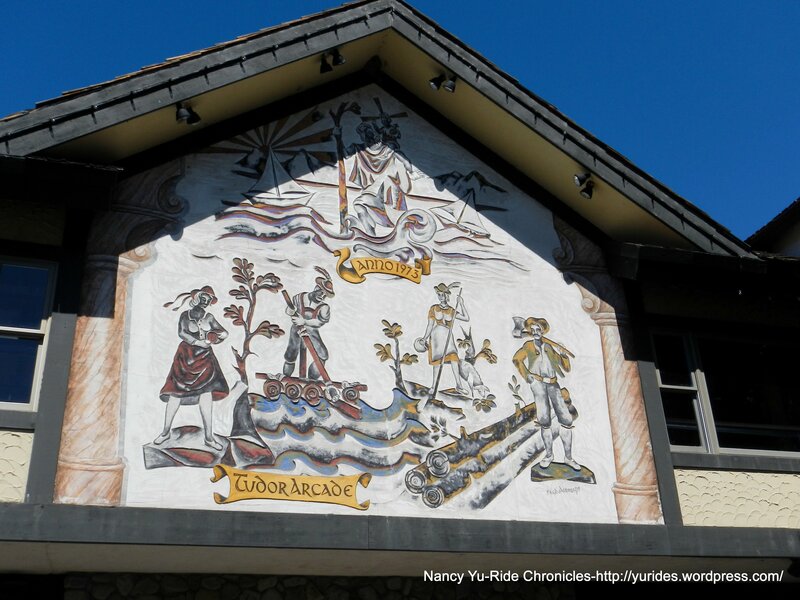 For us, the Pine Cone is start and finish of this ride. 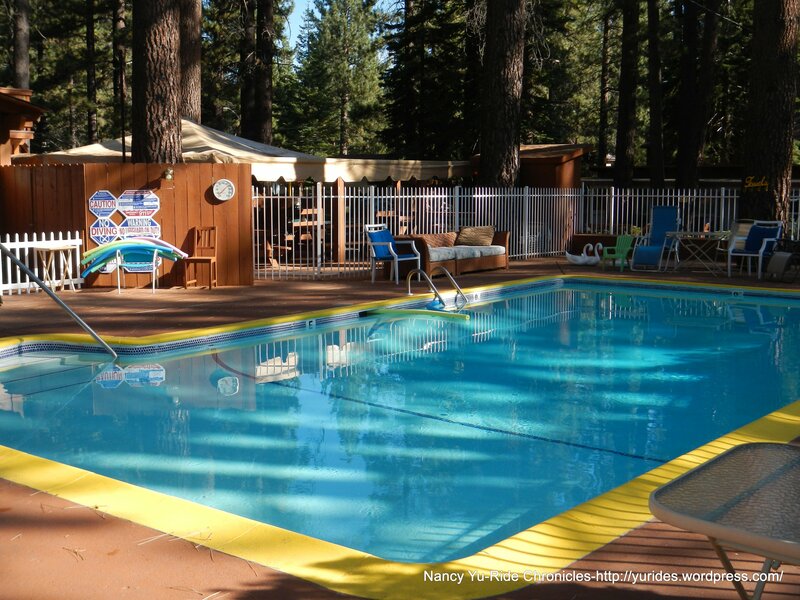 It’s so convenient to be able to leave right from the motel-no driving is required! The starting elevation for this ride is at ~6200 feet. We exit the backside of the motel on James St to 15th St to avoid some traffic before heading north on Emerald Bay Rd/Hwy 89. If you don’t like the traffic, you can also hop on the South Shore Bike Trail that runs parallel with the road, the only down side to doing this is that you will be sharing the path with all the tourists on hybrid and cruiser bikes wearing flip flops. The trail begins on 15th St to Camp Richardson and ends 3.6 miles later at Spring Creek Rd. Honestly, you’re better off on the main road. 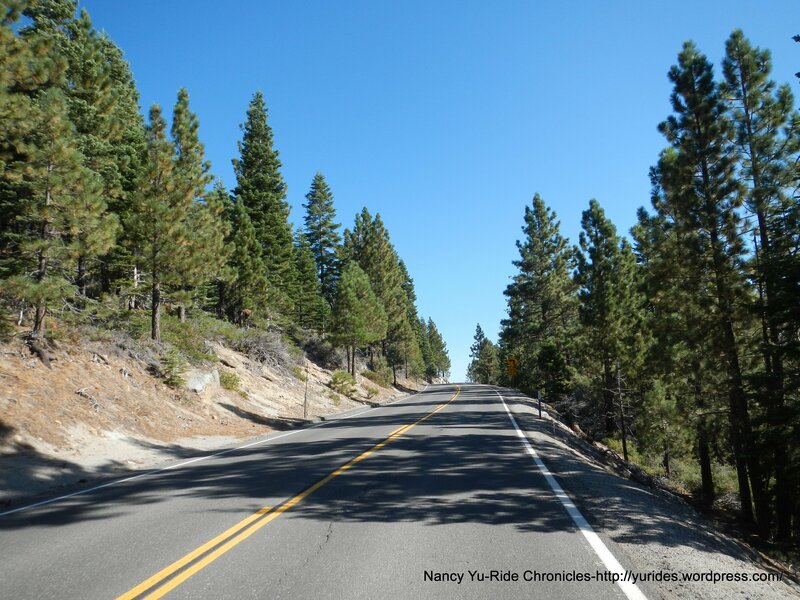 Please note that the first 20 miles on Hwy 89 from South Lake Tahoe towards Emerald Bay to Homewood has little to no shoulder widths and some sections with steep drop offs-ride with caution and pay attention to the road ahead of you! 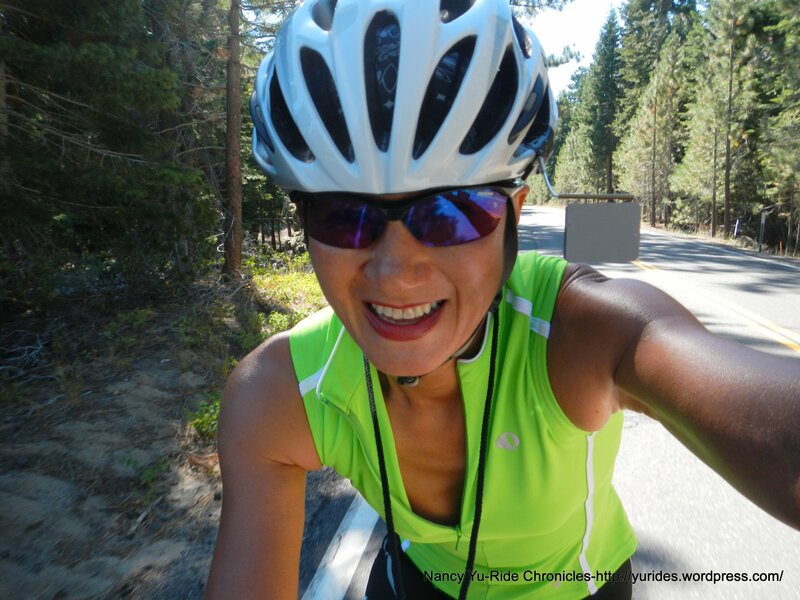 The first steepest climb of this whole ride is going up towards Emerald Bay. 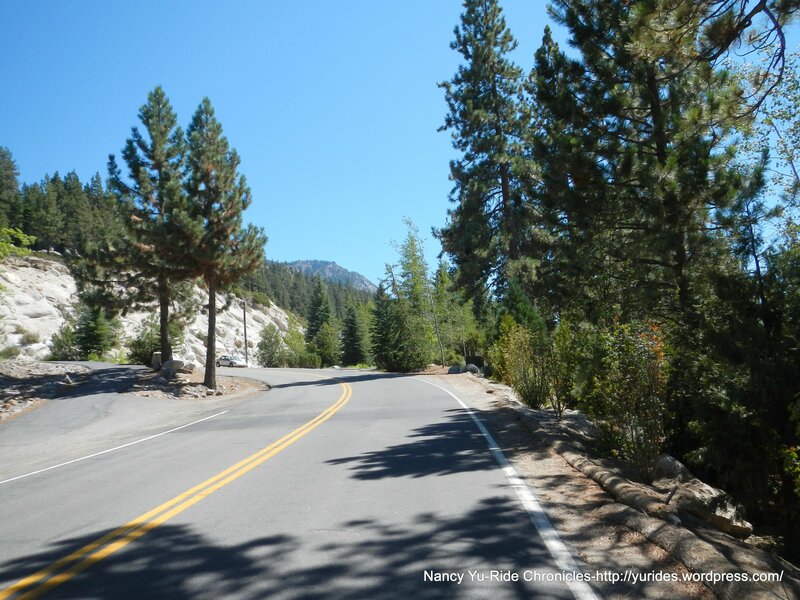 There is a series of hairpin turns up to the ridge between Cascade Lake and Emerald Bay. The gradient ranges from 7-9% with pitches of 10% at the switchbacks. The views of the Big Blue are spectacular! The top of the climb brings us to our stop at Inspiration Point. 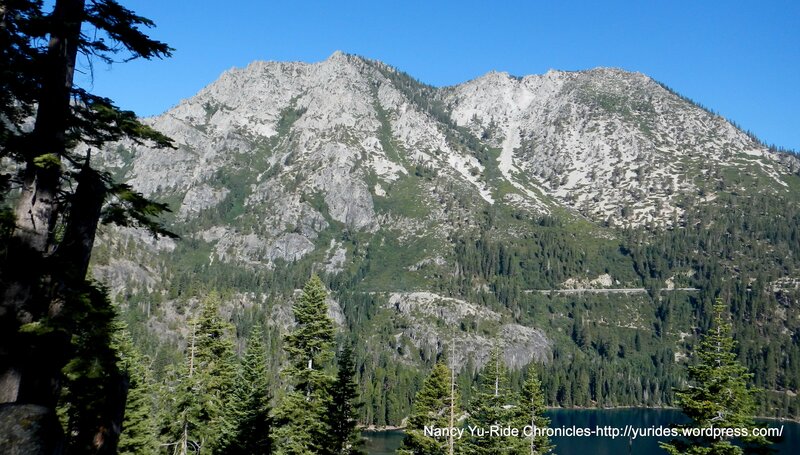 You get breathtaking views of Emerald Bay and the Sierra mountains-WOW! Restrooms are available and I even noticed a food truck at the end of the parking lot. 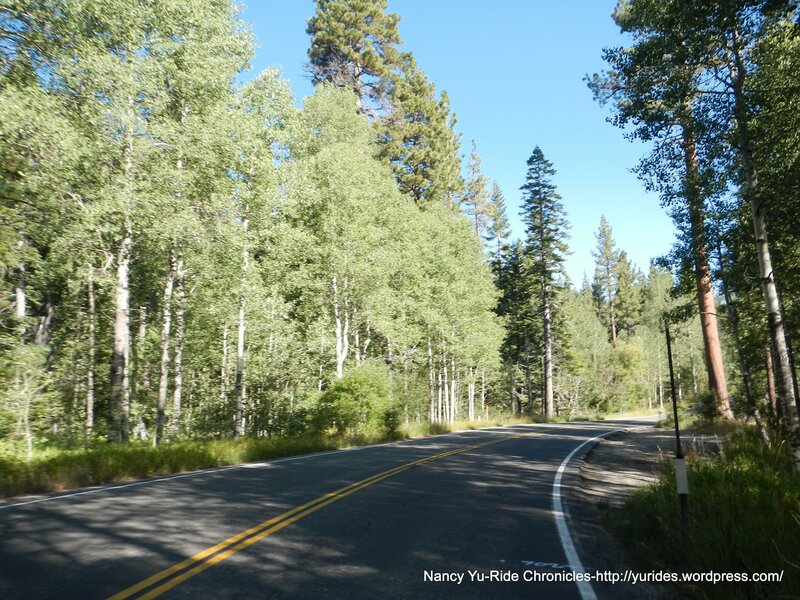 The fun descent on Hwy 89 is followed by another climb up towards D.L. Bliss State Park. 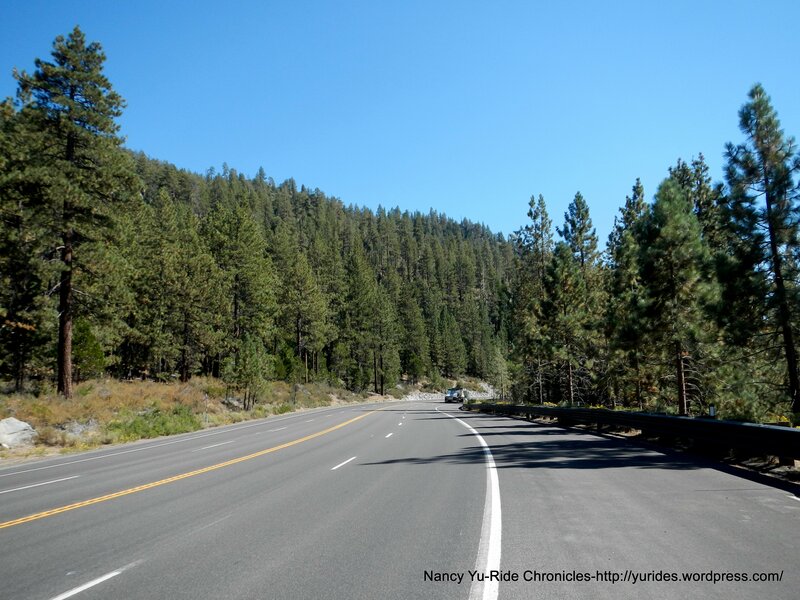 This is the section of road where I got buzzed by a huge trailer truck-I could see it coming up behind me in my rear view mirror but there was nowhere for me to move over, there is absolutely no shoulder area; I just held my line and kept looking forward. It was over in a matter of seconds-the truck whizzed by within a foot of me-Whew! 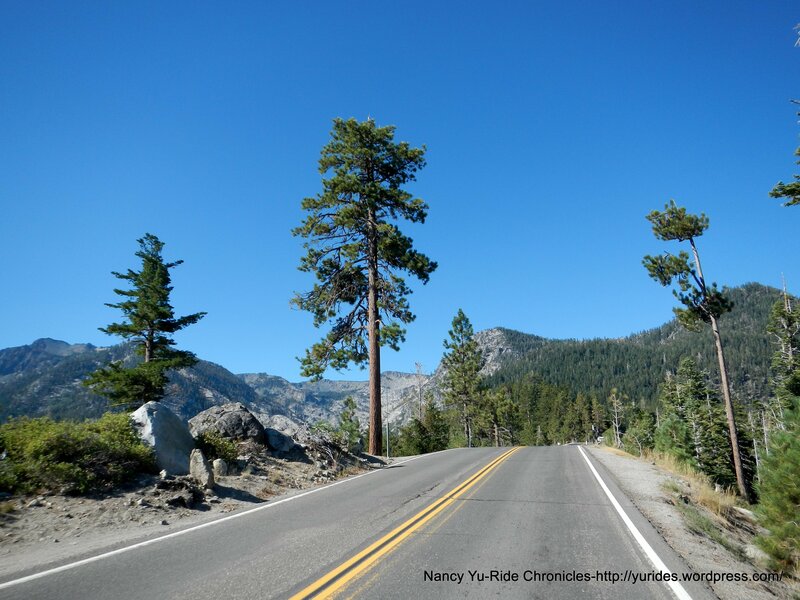 After reaching the top of the climb, you’ll get a blasting downhill for several miles to Rubicon and Meeks Bay. 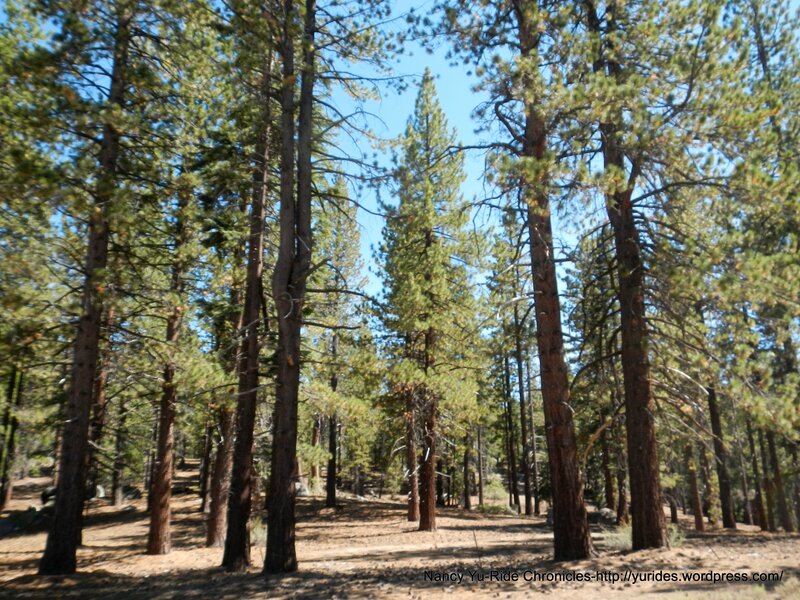 From Meek’s Bay, the road tilts up again and continues north through the forest past Sugar Pine Point State Park. 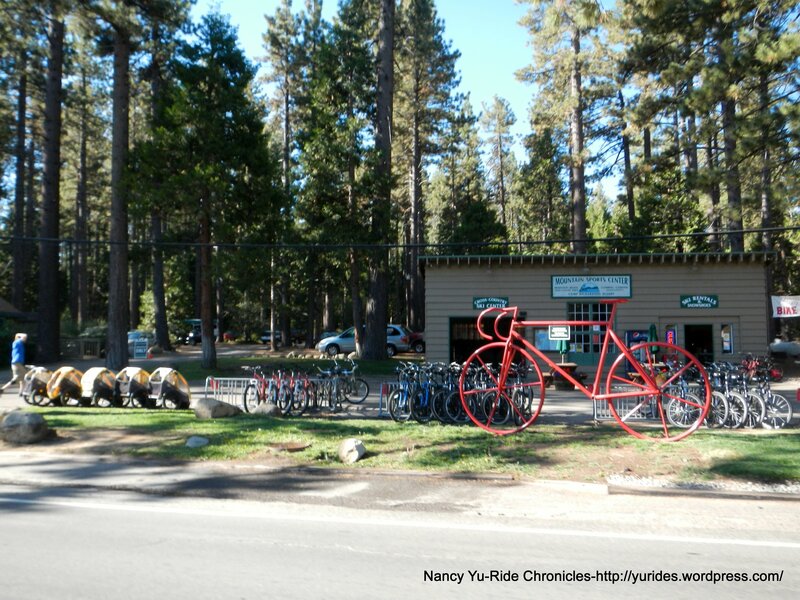 There is a bike trail starting from Sugar Pine Point that goes 10 miles out to Tahoe City. 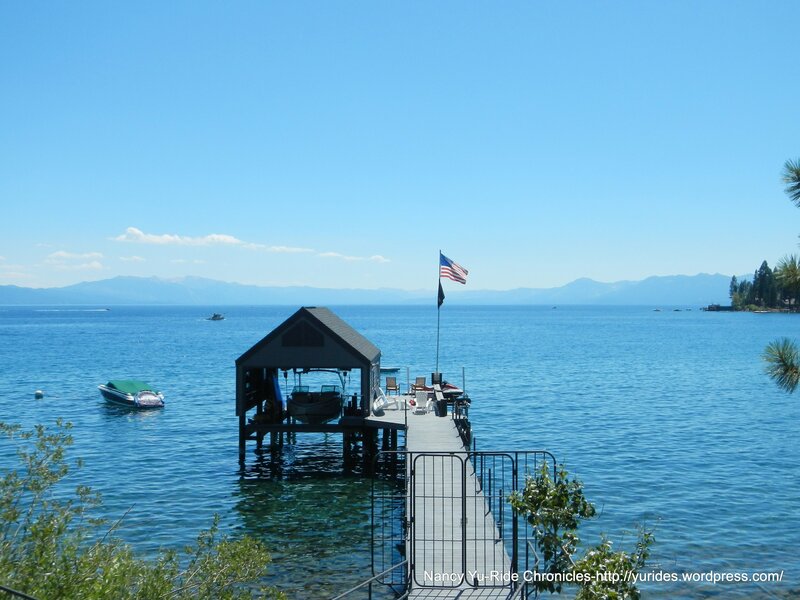 It meanders along the shoreline of Tahoma and Homewood with fabulous views of the lake and the marinas. 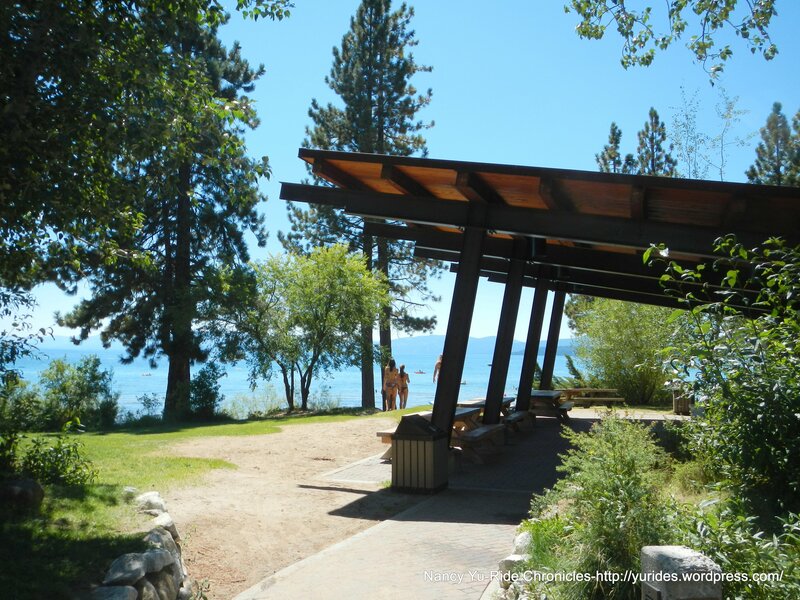 There are plenty of beaches with public restroom and picnic areas. The only thing about this bike trail is that it does have some road crossing which kind of makes it inconvenient to use. 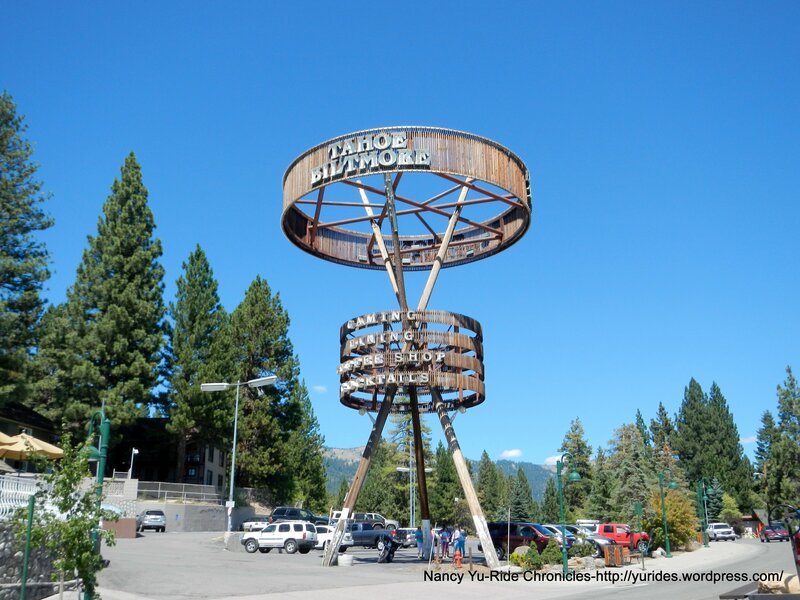 You know you’re in Tahoe City because of the traffic congestion; I think this is the most popular destination for tourists in Lake Tahoe besides Casino Row at the Stateline. 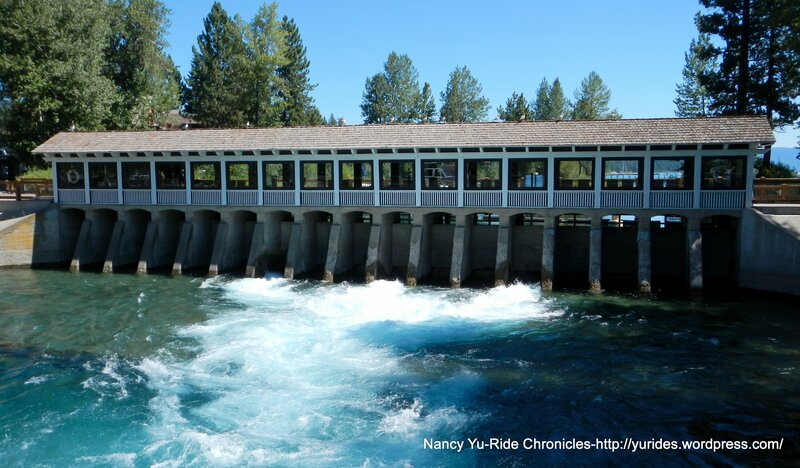 We stop for a brief time at the Truckee River Dam and outlet; the sound and flow of the water is very impressive! 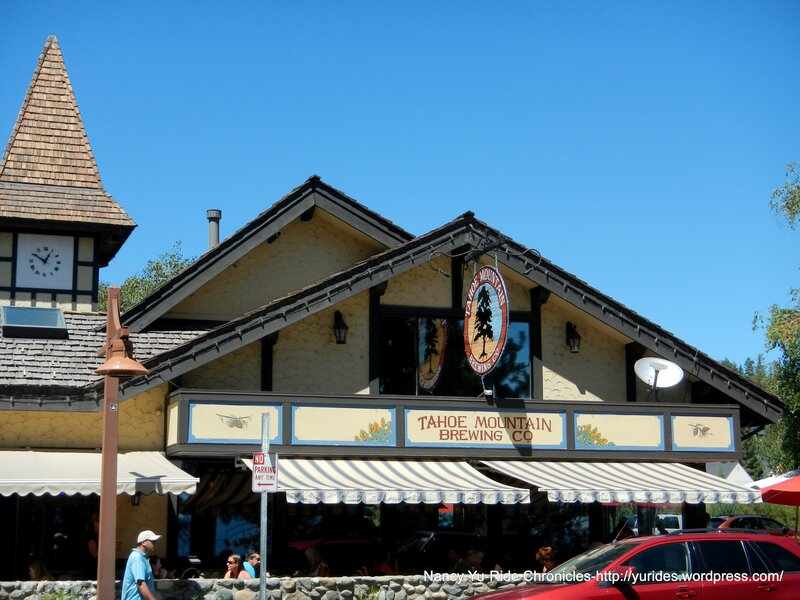 We were able to find a bicycle friendly place to have lunch-the Tahoe Mountain Brewing Co. in Tahoe City. They let us roll our bikes through the restaurant and park them in the patio area right next to our table-how wonderful! 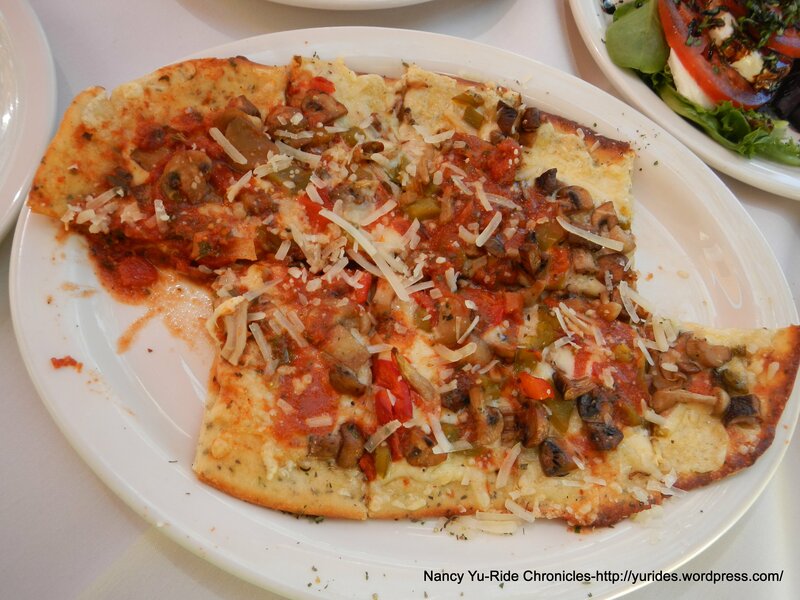 We shared a tomato mozzarella salad, a smokehouse platter with pulled pork and beef tri-tip and a wild mushroom flatbread. 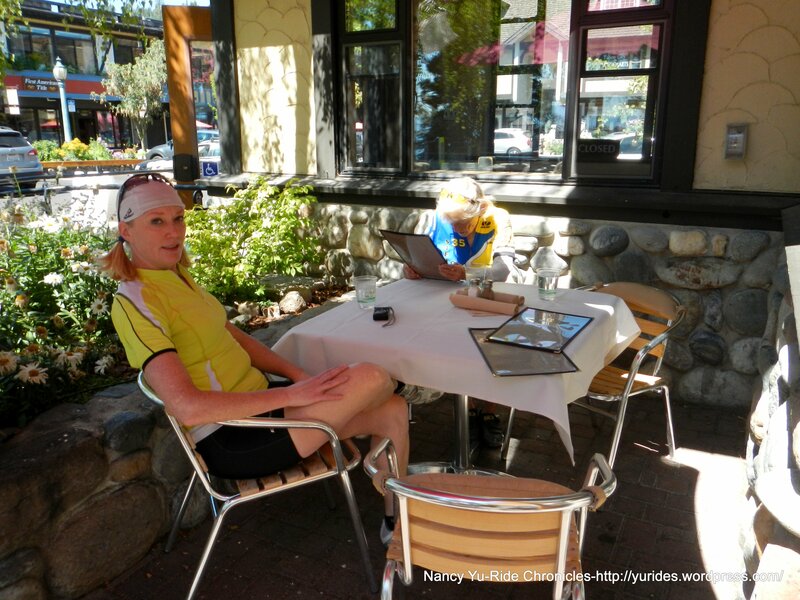 This is the best kind of riding; where you can enjoy the route and scenery and stop for a meal without worrying about time. LOVE IT! After lunch, we continue NE on NV 28. 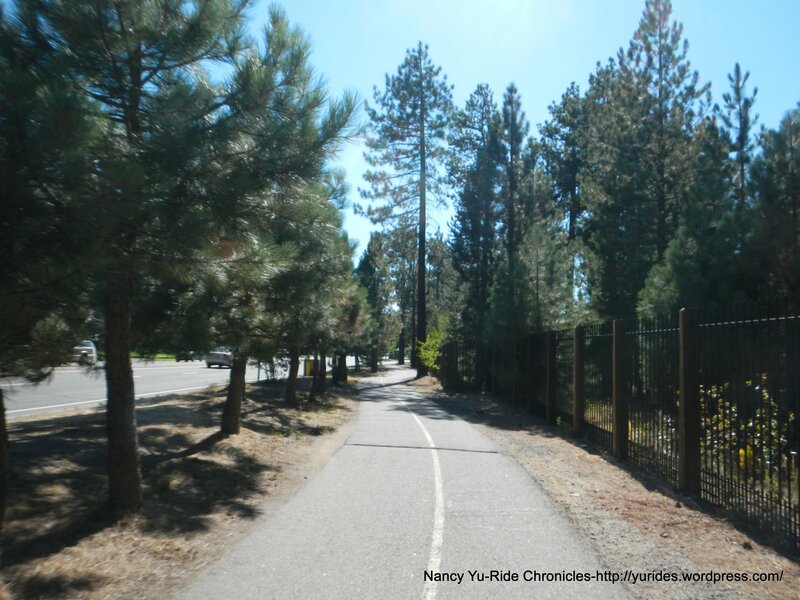 There is also a short section of bike trail that heads out from Tahoe City and a designated bike lane all the way to North Tahoe. There is a short steep climb up to Dollar Point followed by a fast descent towards Carnelian Bay. The terrain out to North Tahoe from Carnelian Bay is pretty flat. 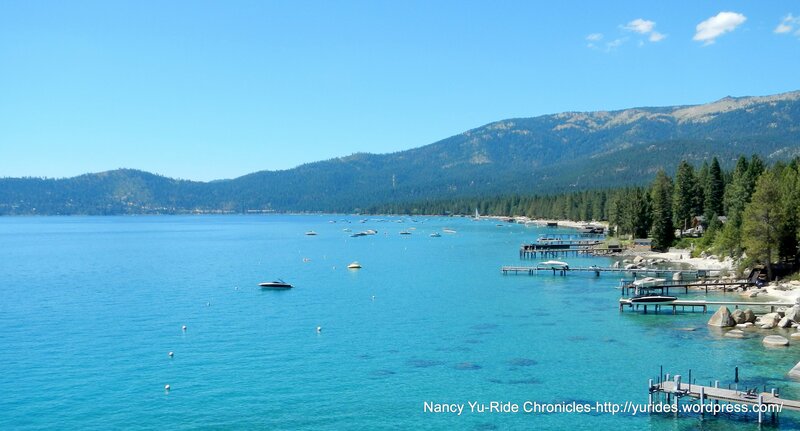 We make a quick pit stop at North Tahoe Beach-this placed is packed with people! There is another short climb along Agate Bay towards Kings Beach. The views of the bay are outstanding! 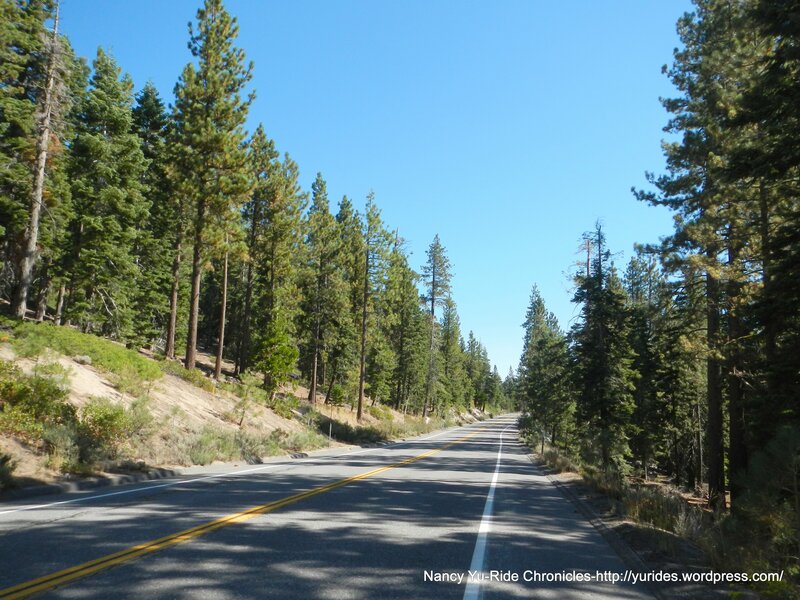 We cross the state line into Nevada just a couple of miles east of Kings Beach. We stay on NV 28 and take a detour onto Lakeshore Blvd. 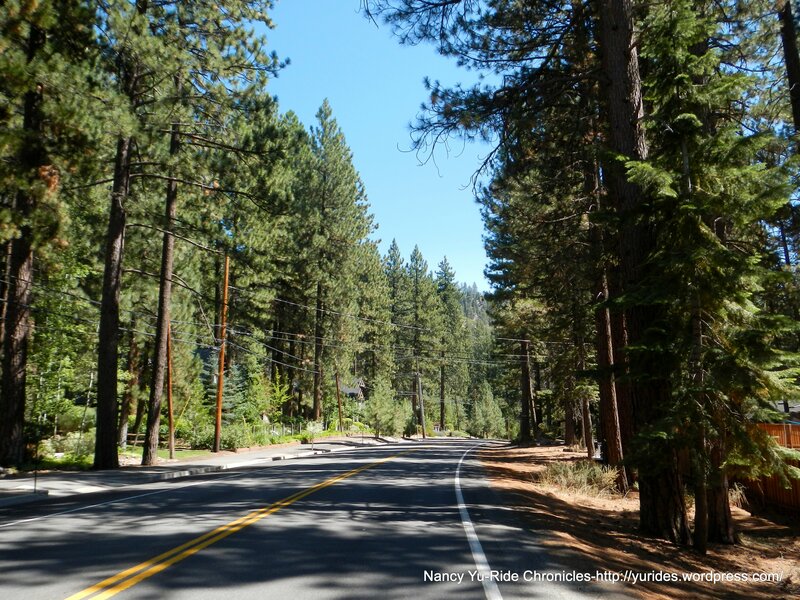 This road takes you off the main highway for a few miles and gives you a chance to view all the ritzy homes at Incline Village. 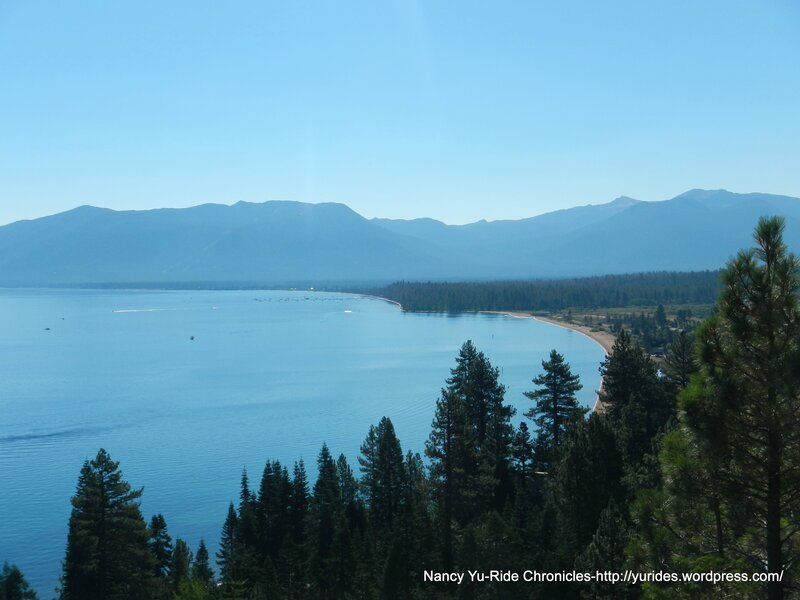 We get back on NV 28 and head south for a few miles towards Sand Harbor for a stop at the Overlook area. Water and restrooms are available here. The lake views are amazing! 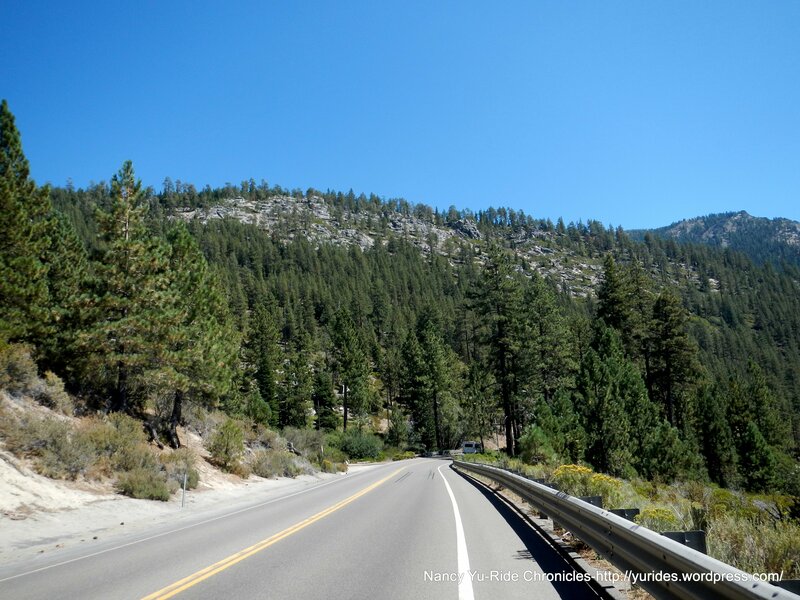 From Sand Harbor, the road ascends steadily for the next 9 miles to Spooner Summit. It’s a gentle climb with an average grade of about 4%-take the time to enjoy the beautiful fir forests and the views of the gorgeous beaches below! The descent from the summit takes us along the flats to Spooner Lake. 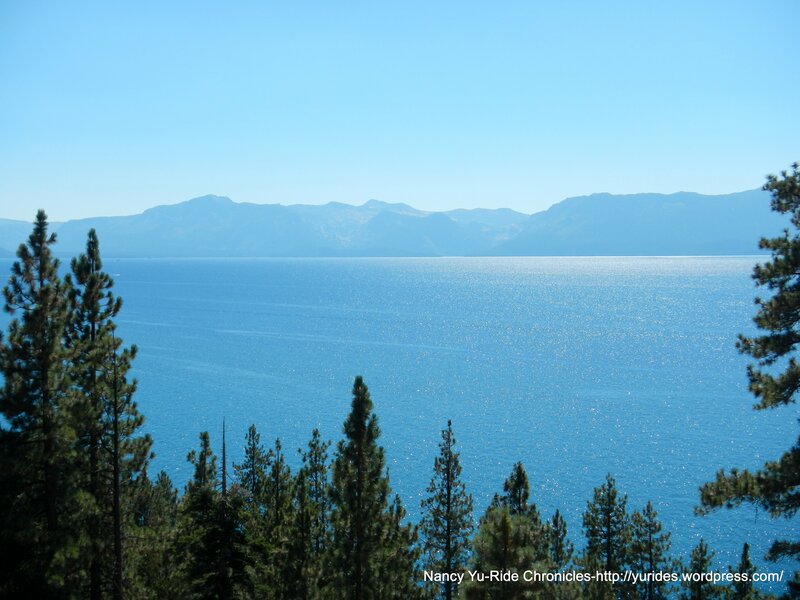 From the NV 28, we turn right onto US 50 for a blasting 4 mile descent with magnificent views of the lake! We make a brief stop at the Cave Rock Vista Point. Restrooms are available here-no water. 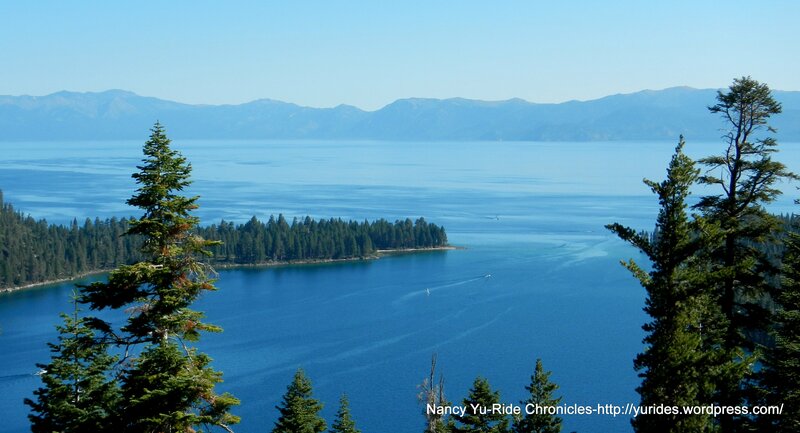 From this point, you can see the many peaks around Lake Tahoe and a view of Cave Rock-just beautiful! 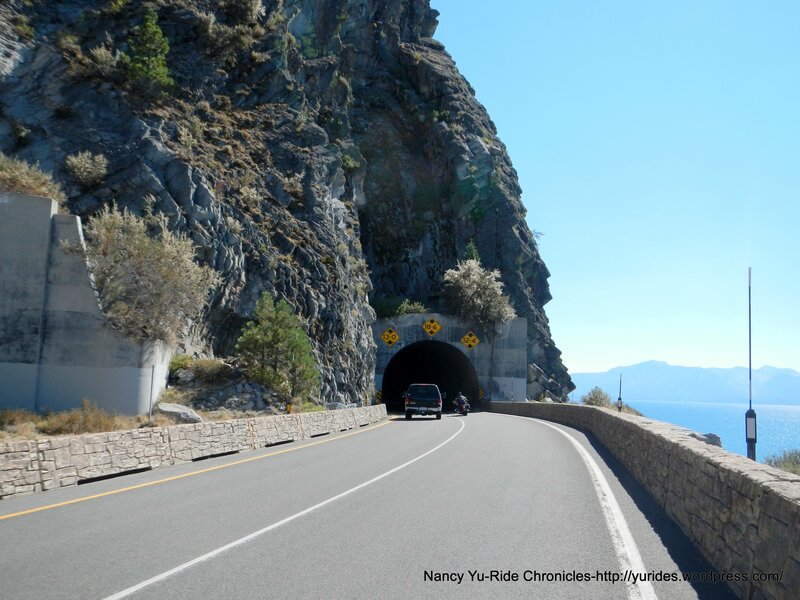 We continue south on Hwy 50 to Glenbrook and go in and out of Cave Rock Tunnel towards Zephyr Cove. As you enter Zephyr Cove, the road congestion increases dramatically-there’s a lot of cars out here! There are places to stop for food and water. 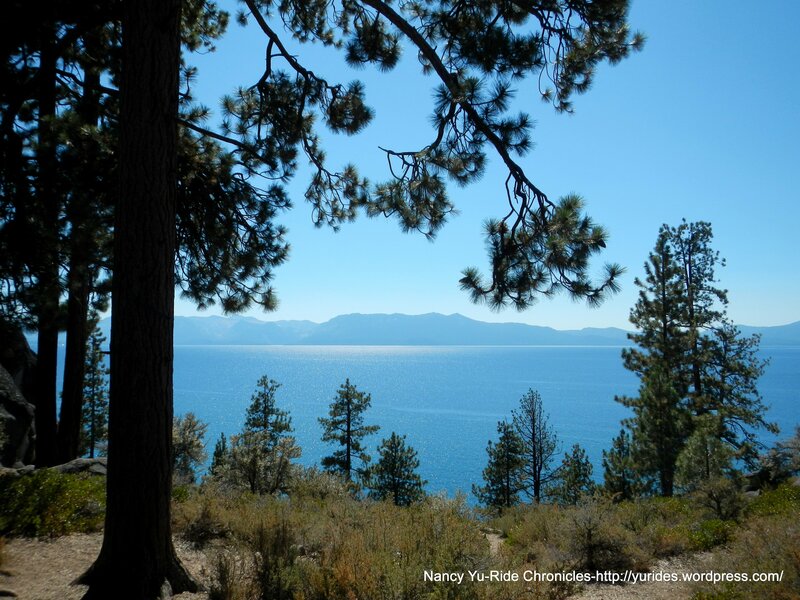 The terrain from Zephyr Cove to Roundhill is a series of short climbs and descents. As you proceed further south, you will come to a clearing and see all the casinos in the distance. You know you’re near civilization when there’s a Safeway nearby! 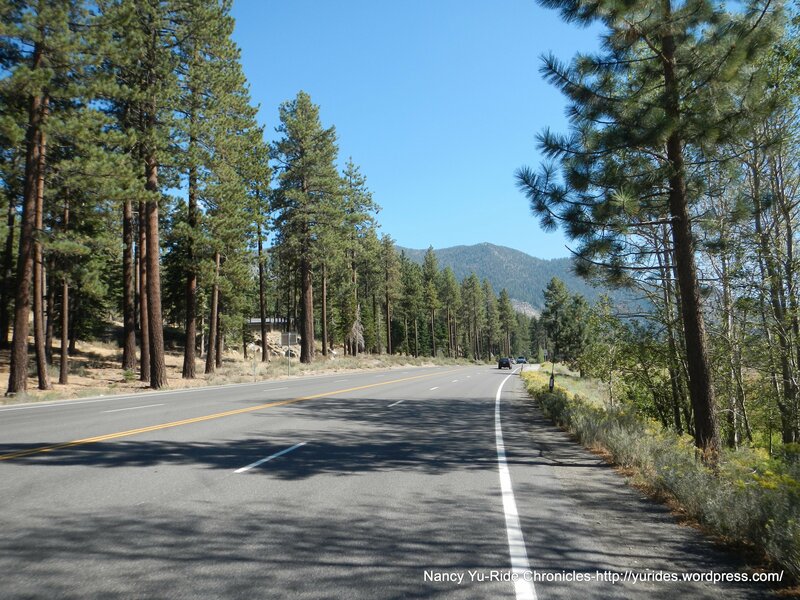 We pass Kingsbury Grade and continue south on US 50 towards the casinos. You must be on high alert as you ride through this busy stretch of road; there are lots of cars and pedestrians and other cyclists. We hop onto the bike path for a short distance before being forced back onto the main road. 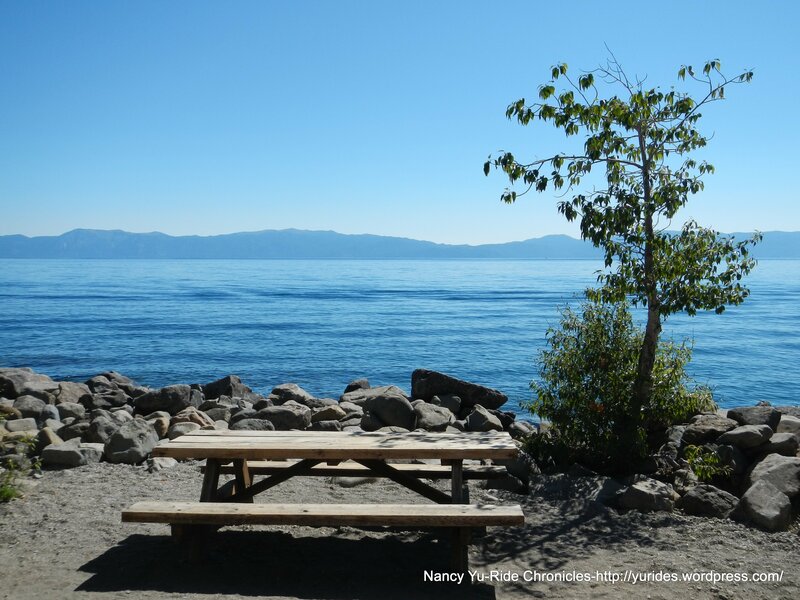 We turn right on Tahoe Keys Blvd to Venice Dr; this is a nice detour off Hwy 50. We take 15th St and James St back to the Pine Cone Motel. 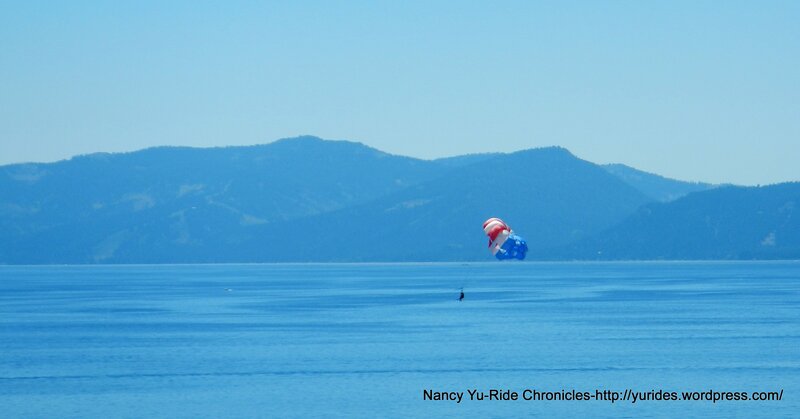 What a perfectly fabulous way to spend the day-riding with friends and going around Big Blue! 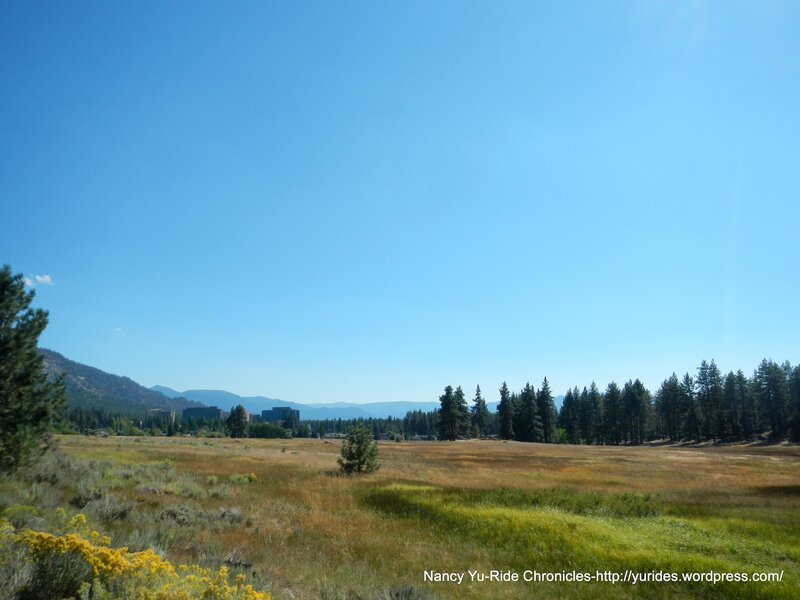 Doing this ride in the summer has its pros and cons; you get the fabulous sunny warm weather and the heavy sightseeing tourist traffic which includes the huge RV’s-it’s really worst on the weekends! You just have to deal with it; it’s all part of being on a bike-share the road! It helps to do the following: wear bright colors, ride with caution, ride predictably, don’t panic, when necessary, pull over to the side of the road to let cars/trucks pass safely. I also have a rear view mirror mounted on my helmet and I run blinking day lights-both front and back. Other than that, it’s a fun and beautiful ride-get a group of friends together and get out there and enjoy it! eye; looking into which the beholder measures the depth of his own nature. I was looking for blogs about Carnelian Bay to share on our site and I came across your post…If you’re open to it, shoot me an email at jane(at)dwellable(dot)com. 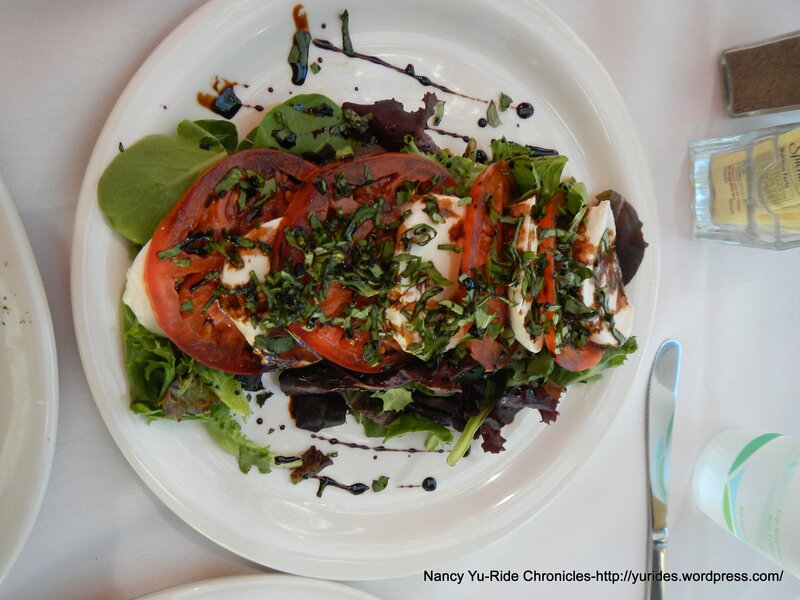 Thank you for the fantastic blog & fabulous photos! 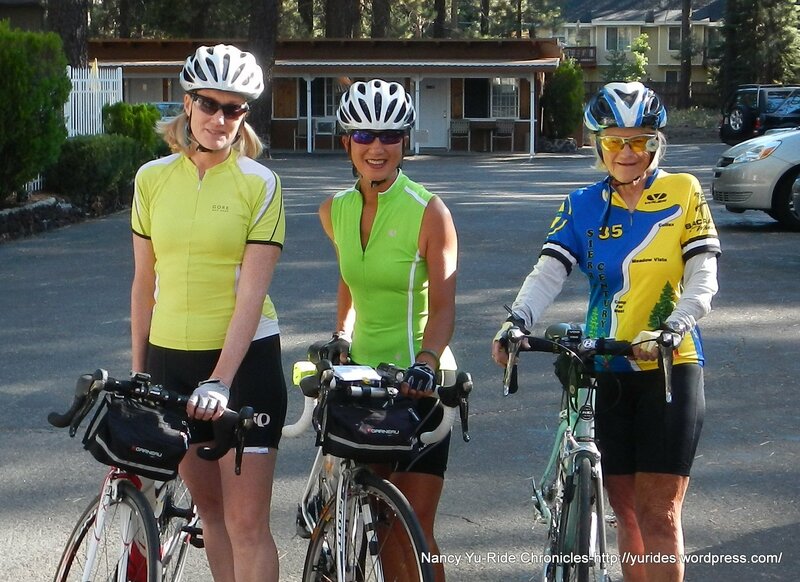 Will be traveling from Seattle area & plan to do the ride with a friend mid July. Your ride report is most helpful. I am very grateful! 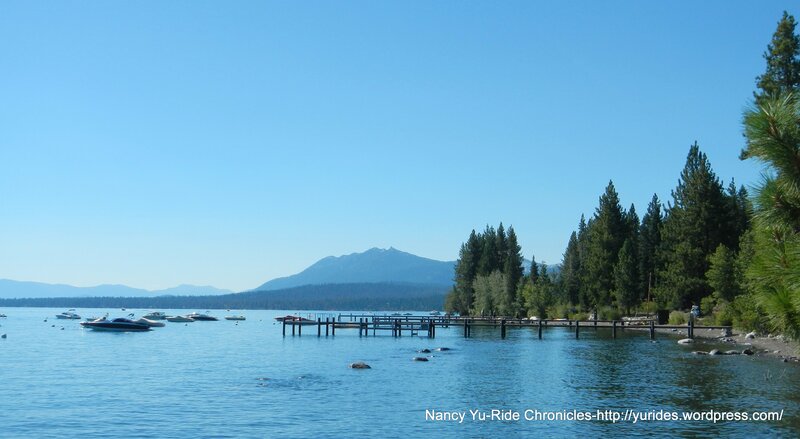 Thank you Nancy for your detailed information on riding around Lake Tahoe. Just curious as to how long it took you, including your lunch stop. We have a wedding at the Stateline at the end of June-thought this would be a great after the wedding activity. Marty, I always guesstimate doing at least 10mph which would come out to be about 7 hrs. This includes photo stops and lunch. Of course, you can always ride faster, but why? 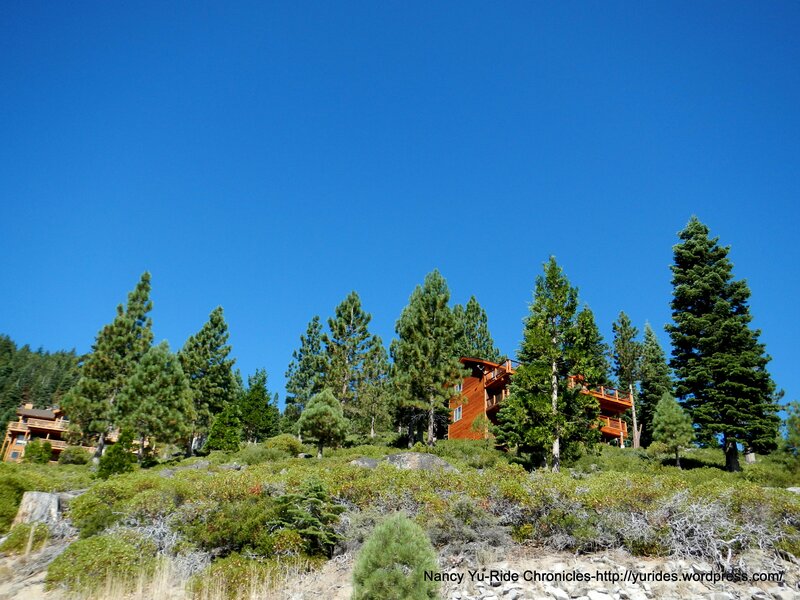 Have fun in Tahoe, it’s gorgeous out there! It’s an epic ride every time. I will respectfully disagree with the advice to ride clockwise as I hear and read it often. 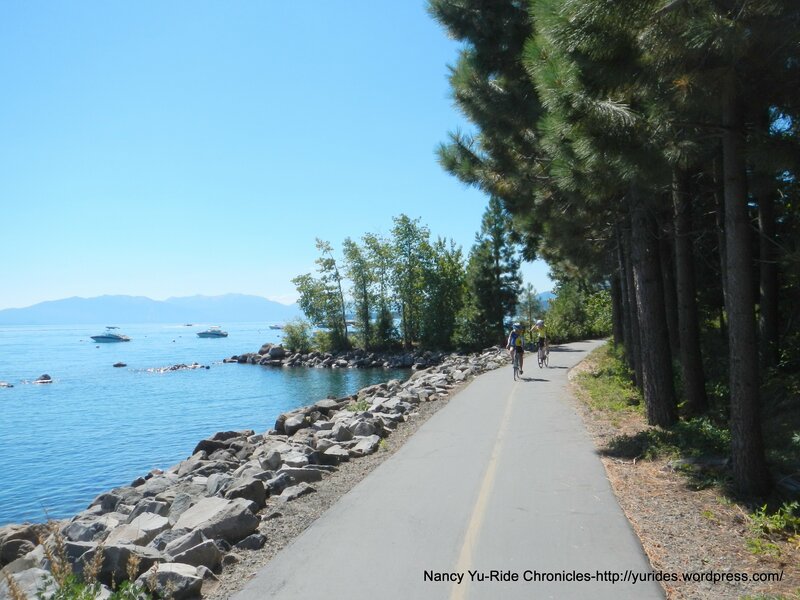 It is a huge mistake and over 90% of cyclists ride lakeside. It makes for being endlessly cut off by drivers and pedestrians arriving to and departing from their time at the lake. 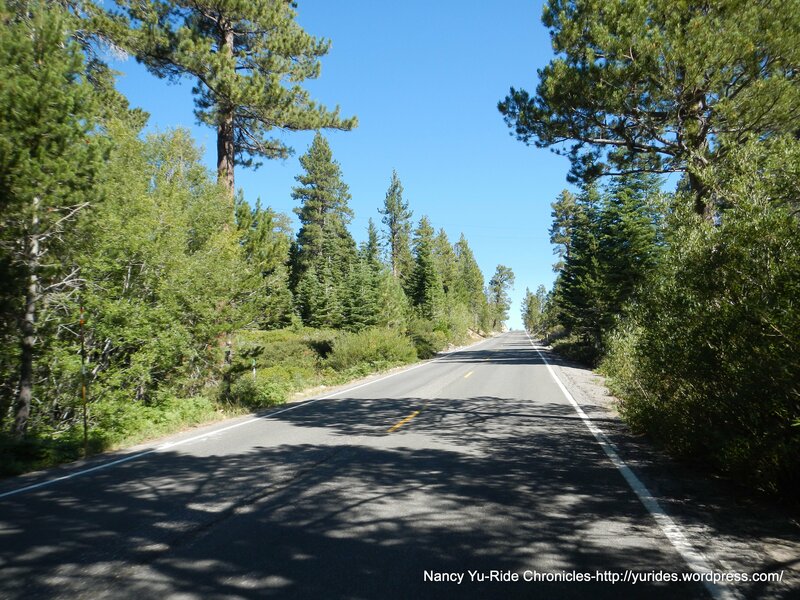 The Emerald Bay section alone is a huge reason to NOT ride clockwise. The climb is steep with no shoulder and the drop offs would surely be the end of you. I cringe every time I see cyclists going clockwise through that area. I ride a gravel bike on the road in Tahoe because of how many drivers have decided I should ride in the gravel as they run me off the road. 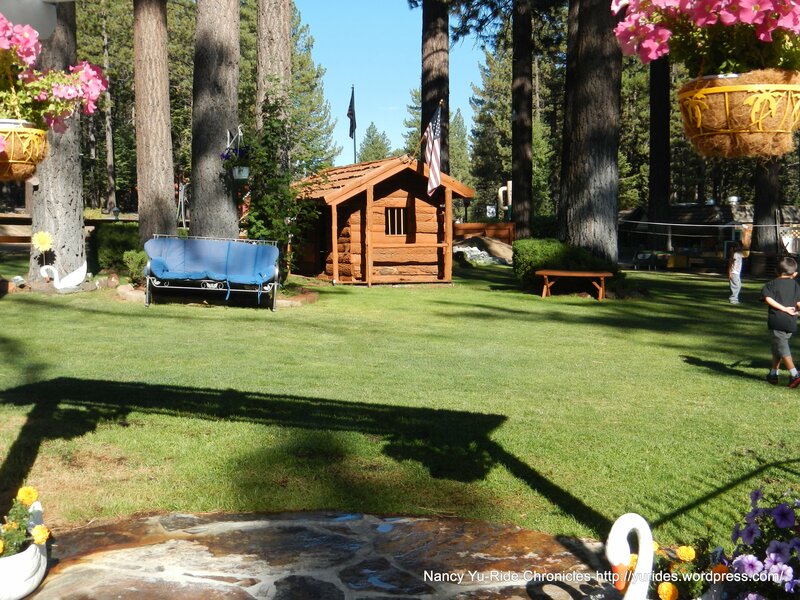 This is a 360 video (it may not play correctly on your device) of Emerald Bay going counter clockwise. It is spectacular and spectacularly dangerous more so going clockwise. 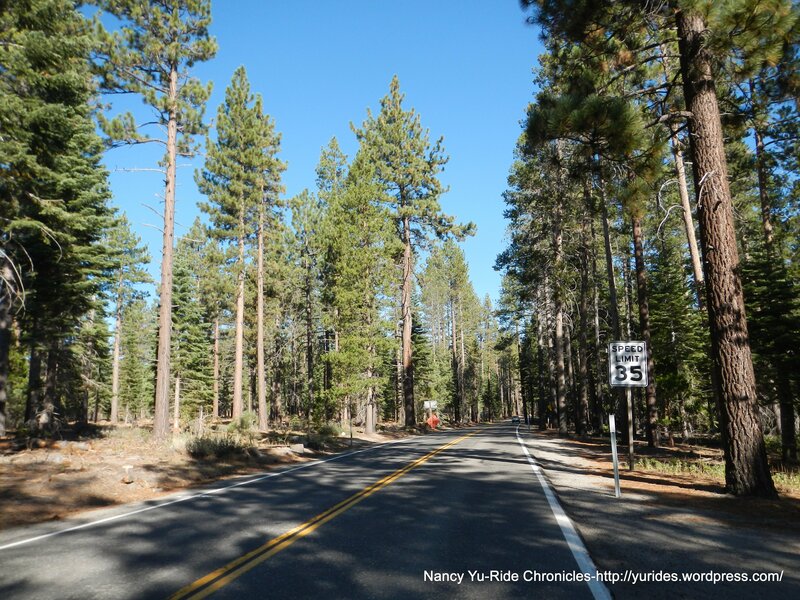 Getting through Emerald Bay before 7:00 with all the traffic and all the parked car is key to a good safe ride. 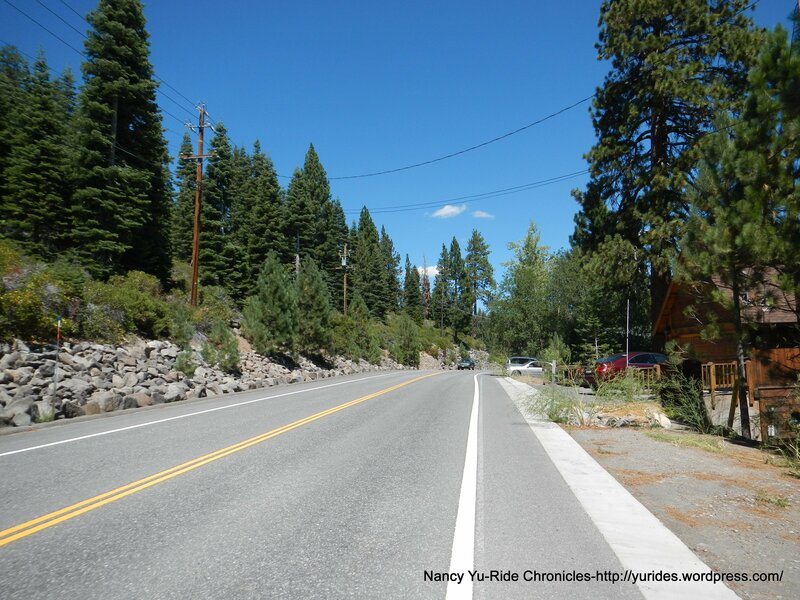 One on of my rides around the lake this year I added the Marlette Lake Trail and Flume Trail for the most awesomest ride of my life at 58.